Romanesque art emerged during the Middle Ages influenced by Roman art and located mainly in rural and Christian environment. We can find Romanesque churches, chapels, monasteries and castles. 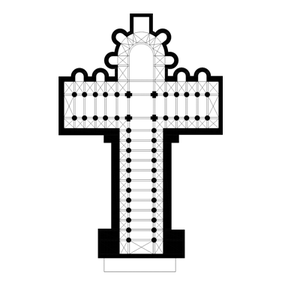 Romanesque churches could have a Roman basilica plan but were mainly Latin cross formed by the cruise where the main nave and transept or shorter ship crossed. The semicircular apse crowned the whole. The emmpleado materials was low and thick stone walls, buttresses which supported semicircular vaults and domes or barrel. The windows were small well rendondas or loopholes. Romanesque sculpture = = Churches and monasteries were decorated with capitals showing scenes from the Old and New Testaments used for the training of illiterate people almost entirely, and his finish was far from the beauty and expressiveness of Greek and Roman sculpture. Painting Romanesque = = The most prominent figure of Romanesque painting is indeed the Christ Pantocrator, or judge. He looked sober and often painted in the apse behind the main altar. This page was last modified on 21 November 2015, at 00:25.